Hand Printed Wallpaper Roll by Peggy Angus Wallpaper. A handprinted 10m roll featuring an exclusive geometric ‘Twist’ print from the Peggy Angus archive. Each design is available in 5 colourways with an additional inverse print. Part of an exclusive collection by Peggy Angus Wallpapers for The New Craftsmen, this range of hand-printed wallpapers feature original prints, sourced from Peggy’s archive; the designs of which dominated London’s interior scene of the 1960’s. This collaboration represents the first time that Peggy Angus’ prints have been available to purchase since they were originally commissioned. Produced by Peggy’s family in the Shetlands, each roll is a work of art in itself. Every section is printed individually in a time intensive process to produce a charm and texture visibly lacking in machine printed methods. To inquire for samples, please require using the 'Contact Us' button above. Material: Paper and emulsion paint. Care Instructions: Clean with cloth, to apply use standard wallpaper paste. No two prints even from the same block are exactly alike. The subtle irregularity in the pressure of the printer’s hand can never be matched by the machine. The overall effect is much more sympathetic to the eye than the regularity of a machine produced design. The “Twist” represents one of Peggy Angus’ earliest wallpaper designs. Each roll is produced using hand-cut lino blocks, with each print being individually painted, and applied over 280 times. This process creates unique roll each with its own subtle variations in colour and texture. Peggy Angus was a British painter, designer and educator known for her bold and eye-catching wallpaper and tile designs, as well as an enthusiastic champion of creative patronage. 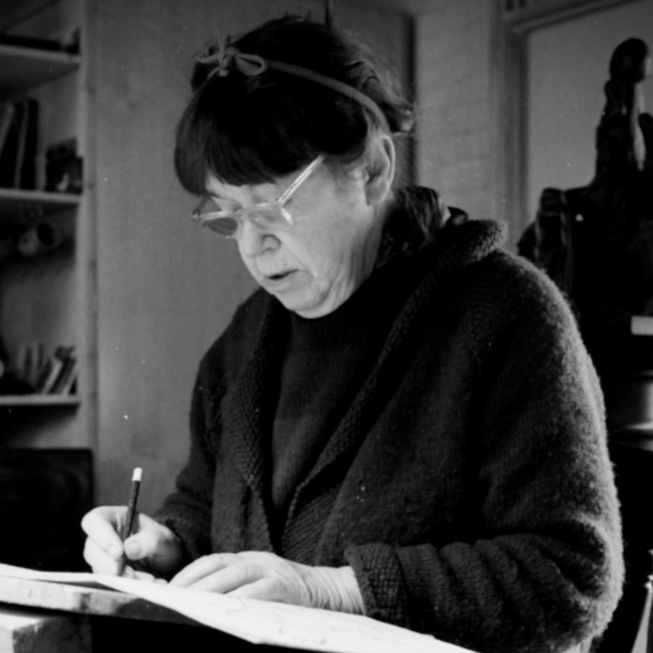 Strongly influenced by the artist William Morris, Peggy started her career a century ago, studying design at the Royal College of Art under the tutelage of Paul Nash. Post war Peggy's work was commissioned for high profile London building projects including schools, and Heathrow & Gatwick airports. Now her designs will be brought back to life by her granddaughter Emma and her niece Zoe, who will hand print three of Peggy’s timeless wallpaper designs for the first time since they were originally commissioned, exclusively for The New Craftsmen.